ORDER NO.SO (SE-I) Transfer/ 2018 dated Lahore, the 22nd January 2019 regarding latest Punjab education news of transfer Posting School Education by a government of the Punjab school education department. 1. Mr. Naseer Ahmed (BS-19), District Education Officer (SE), Bahawalpur Is hereby transferred with immediate effect and directed to report to the School Education Department for further orders. 2. Mr. Iqbal Ahmed Ch. 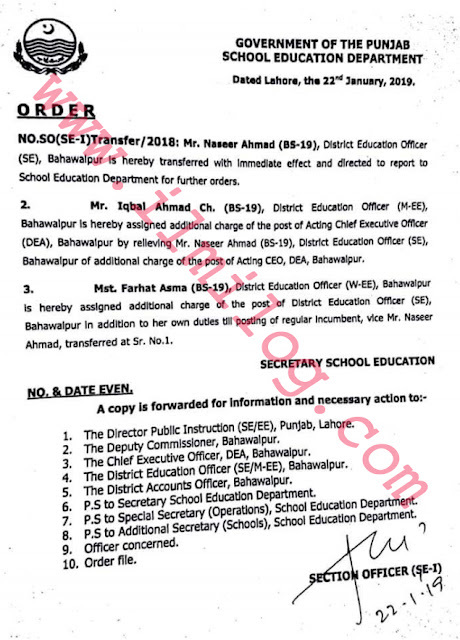 (BS-19), District Education Officer (M-EE), Bahawalpur is hereby assigned additional charge of the post of Acting Chief Executive Officer (DEA), Bahawalpur by relieving Mr. Naseer Ahmad (BS-19), District Education Officer (SE), Bahawalpur of additional charge of the post of Acting CEO, DEA, Bahawalpur. 3. Mst. Farhat Asma (BS-19), District Education Officer (WEE), Bahawalpur is hereby assigned additional charge of the post of District Education Officer (SE), Bahawalpur in addition to her own duties till posting of regular Incumbent, vice Mr. Naseer Ahmad, transferred at Sr. No.1. NO. St DATE EVEN,:-1. The Director of Public Instruction (SE/EE), Punjab, Lahore. 2. The Deputy Commissioner, Bahawalpur. 3. The Chief Executive Officer, DEA, Bahawalpur. 4. 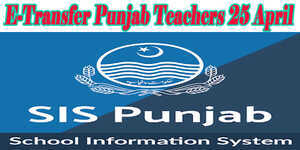 The District Education Officer (SE/M-EE), Bahawalpur. 5. The District Accounts Officer, Bahawalpur. 6. P.S to Secretary School Education Department. 7. P.S to Special Secretary (Operations), School Education Department. 8. P.S to Additional Secretary (Schools), School Education Department. 9. Officer concerned. 10. Order file.